McClain senior Maddy Stegbauer elevates for a layup as Miami Trace’s Shay McDonald bites on a pump fake in the third quarter at McClain High School on Wednesday. 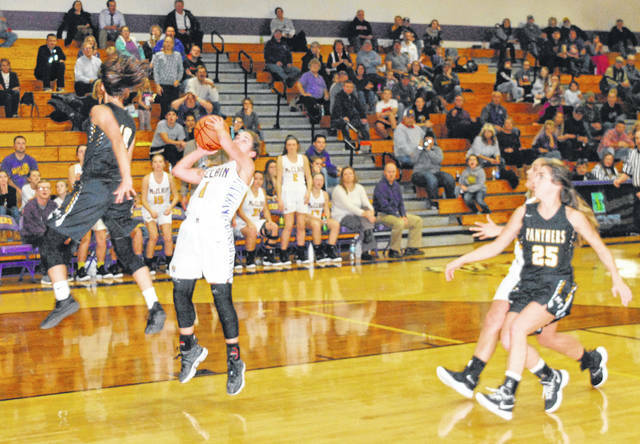 GREENFIELD — The McClain Lady Tigers continued their hot start to the season on Wednesday at home when they beat the visiting Miami Trace Lady Panthers 37-35 and moved to 4-0 overall on the season and 2-0 in Frontier Athletic Conference play. Bryn Karnes recorded the first two baskets of the night for McClain as they jumped out to a 4-0 lead in the first quarter and the Lady Tigers stretched their lead to 7-2 on a three pointer by Kyla Burchett a short time later. Cassidy Lovett and Shay McDonald combined to score all six of the Lady Panthers’ points in the first and Miami Trace trailed 9-6 as the teams prepared for the second quarter. McClain extended its lead to seven points at 16-9 over the first three and a half minutes of the second quarter before the Lady Panthers called timeout with 4:31 to play in the half. Following the stoppage the Lady Panthers finished off the half with an 11-6 run that was capped when Lovett hot one of two free throws with 37 seconds to play and brought Miami Trace to within two points at 22-20 as the teams headed to the locker room. In the third quarter the Lady Panthers recorded six straight points following a basket by Karnes to take their first lead of the night at 26-24 with 4:02 to play in the period. McClain’s Maddy Stegbauer tied it at 26 with a driving layup a short time later but that would be the final point of the quarter for the Lady Tigers as MT held them without a point over the last three minutes of the third quarter. During that time the Lady Panthers were able to net three points as Delaney Eakins hit one of two foul shots and Olivia Wolfe hit a jumper to give Miami Trace a 29-26 lead at the end of three quaters. The fourth quarter was tight from start to finish as the Lady Tigers and Lady Panthers both fought until the final buzzer. It all started with a nifty backdoor cut and ensuing layup by Stegbauer to get the Lady Tigers within a point of MT at 29-28. Then Jaelyn Pitzer spotted up on the wing where Karnes found her for a triple that gave McClain a 31-29 lead. Miami Trace answered immediately with a three of their own from McDonald as it took the lead for the final time in the game. Karnes was at it again on the next McClain possession as she found Kelli Uhrig in the corner for another three point basket that gave McClain the lead for good at 34-32. Lovett hit one of two free throws at the 3:40 mark to get the Lady Panthers within one point at 34-33. Stegbauer scored a bucket with 1:54 to play to extend the McClain lead to 36-33 and went one of two from the foul line with 17 seconds to play to ice the game for the Lady Tigers. Miami Trace had plenty of chances to tie the game late as Pitzer, Karnes and Uhrig combined to go 0-5 at the charity stripe in the final minute. The Lady Tigers will be back in action on Saturday when they host Huntington in non-league play. Elsewhere in the FAC on Wednesday Washington beat Chillicothe 45-21 and Jackson took care of Hillsboro 36-31.